A little early, but getting in the Spirit! 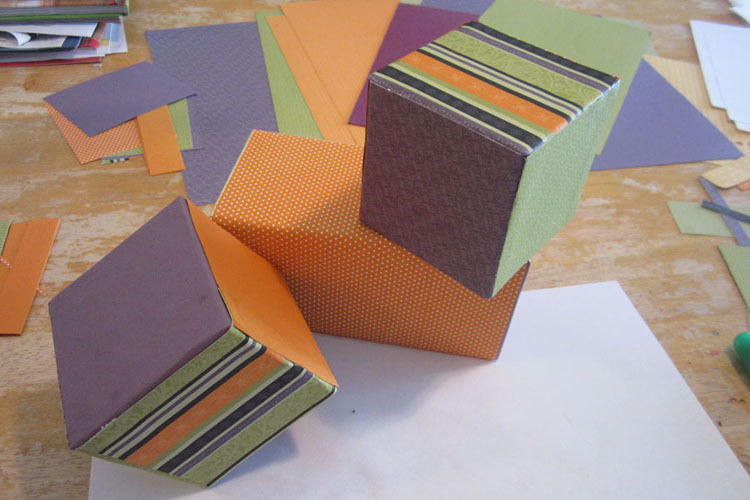 I came across this craft project in one of my (many) crafty newsletters, How Does She?, and I just couldn't pass it up, once I researched the costs... The supplies were offered at PickYourPlum.com - they post crafty deals once a day, in limited supply, at a pretty good savings. 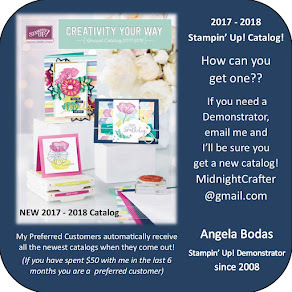 (enabler alert: You may want to sign up :-) Anyhow, I got a set of 3 unfinished wood blocks, and the vinyl lettering and numbers for a fantastic price of $16 including shipping (they usually offer flat rate shipping if you buy one set or a few, nice!) But I must warn you, sell outs are pretty common, so check first thing and buy if you like it. If you think on it and come back, chances are it will be sold out. ANYHOW... 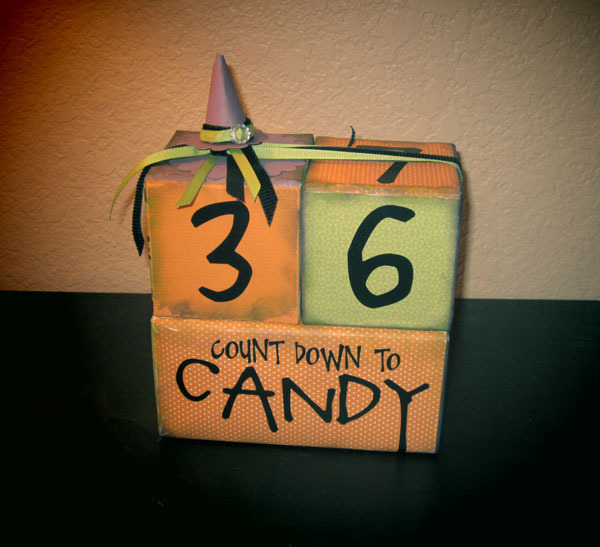 I decided this would be easy and the kids would get a kick out of it, so over the weekend we decided to make it: a Halloween Count Down. 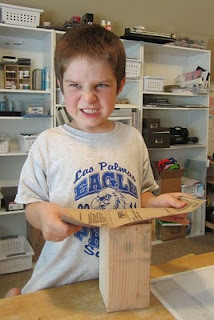 Nothin' like sandpaper to get the Grrr out! The blocks are 3.5" squares, and the long rectangle is 3.5" x 7" long. I cut my spooky paper to about 4 inches and wrapped the edges over on most of the sides, cutting the last side to a 3.25 square to finish. The rectangle is actually wrapped on 3 sides with a 12" sheet cut to 7.5" and then the last side 3.25x6.5", with the ends covered in a couple 4 inch pieces. I had some scraps of the retired Designer Paper "Cast -a-Spell" which worked for the blocks, and for the larger rectangle I used a scrap of Island Oasis. Also used were some various scraps in Old Olive and Pumpkin Pie. I used the Multipurpose Liquid Glue to adhere everything. Once the blocks were covered, we tried sanding the edges, but I also thought that a dab of ink to it would add a little extra as well. The kids loved both these techniques, and did pretty good for the first time -though they were a bit heavy handed with the inking! 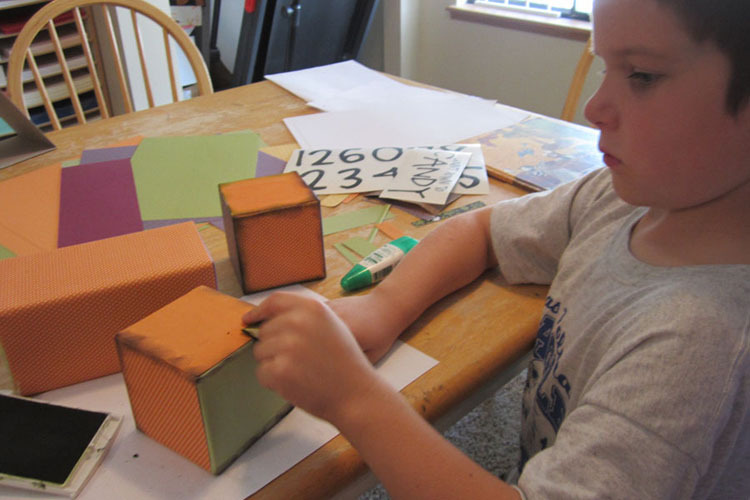 Note: If I were to do it again, I might try another method I saw for covering the blocks : paint the blocks a solid color all over, and adhere just squares of paper to the center of each side. That gives a very nice look, but I didn't want to break out the paint with my helpers today (they get a little carried away with paint projects!). You could also embellish the sides with stickers or spooky enhancements! 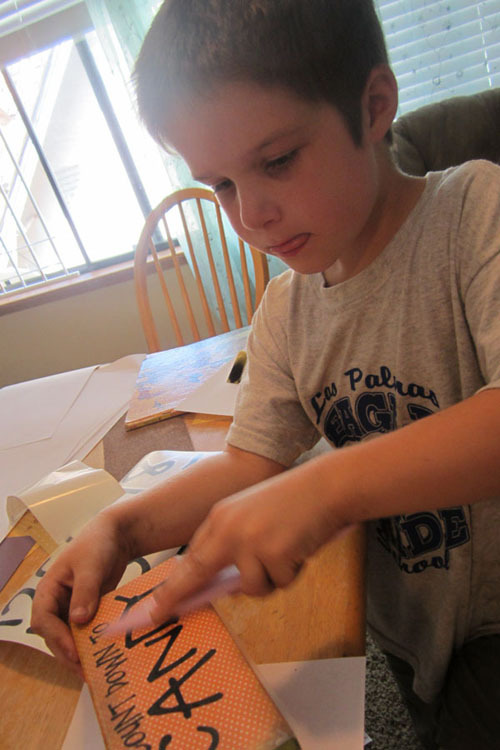 After the blocks were all "spookified" we applied the vinyl letters and numbers that came with the kit. These were very easy to apply - just place, rub, and remove the transfer sheet. They even gave you a hand with that: the numbers for each block came in a row, so you don't have to figure out the right combination to give you working digits on your countdown. 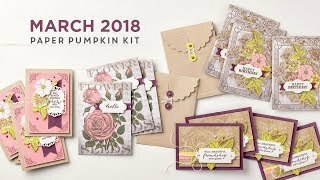 To make your own, you could also use stamps, or number/letter stickers, maybe some embellished chipboard pieces, or you could print them and cut the shapes to fit or use a paper punch. (Psst: you'll need 0,1,2,3,4,5 for the first block; and 0,1,2, 6,7,8 for the second - your 6 needs to be in a font/style that will allow it to be used upside down as a 9) Many different methods to achieve the cute factor in this type of project! 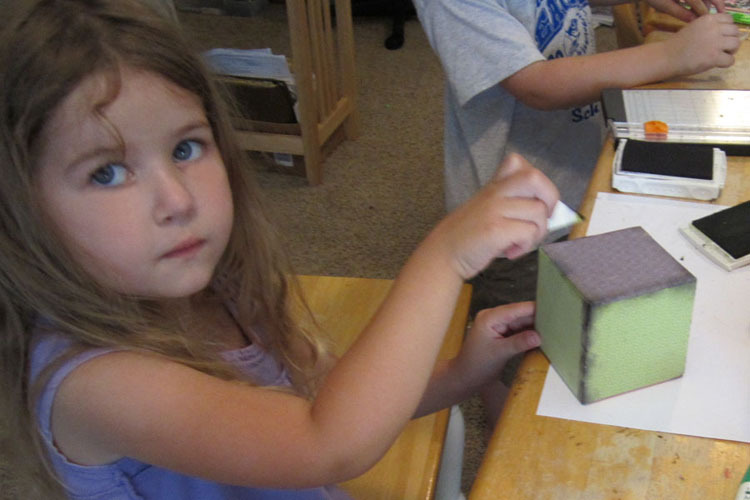 This was a really fun craft outing for me AND my kids. I loved seeing them learn new techniques, and admiring their growing craftiness. They thought the count down was awesome, but were a little sad to see such a BIG number there when we set it up in our living room. It will be fun to watch their excitement grow as the number get smaller and smaller... Here comes Halloween!! The fabulous deal I got on these blocks has expired, and a quick google search of similar offerings did not yield any good results. 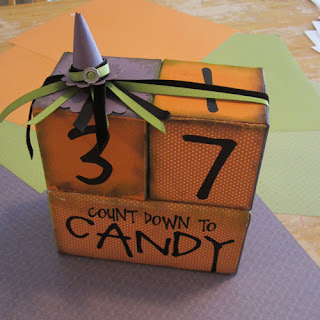 I did find a LOT of ideas on creating your own countdown for just about everything: birthdays, holidays, anniversaries, school events or dance recitals... If you can go to it, you can count down to it! 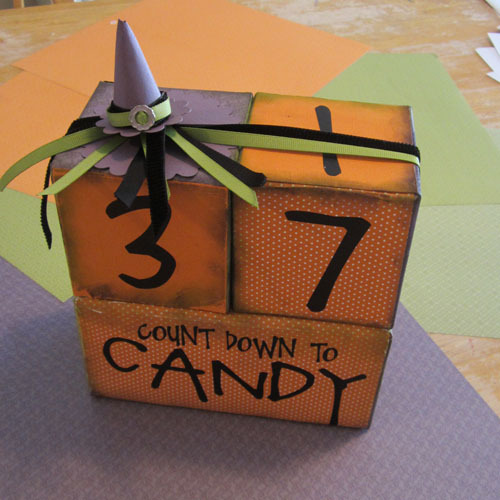 Just pick a theme and craft your own special count down! Lowes carries a 4"x4"x8' lumber piece, it could be cut to MANY blocks, I know they will make a few cuts at no charge - have your measurement ready (by my calculations it will take 17 cuts, you may have to play your Please-help-the-crafty-lady-with-no-saw card :-). You can get 12 4x4x4" blocks, and 6 4x4x8" rectangles out of the 8 foot piece. 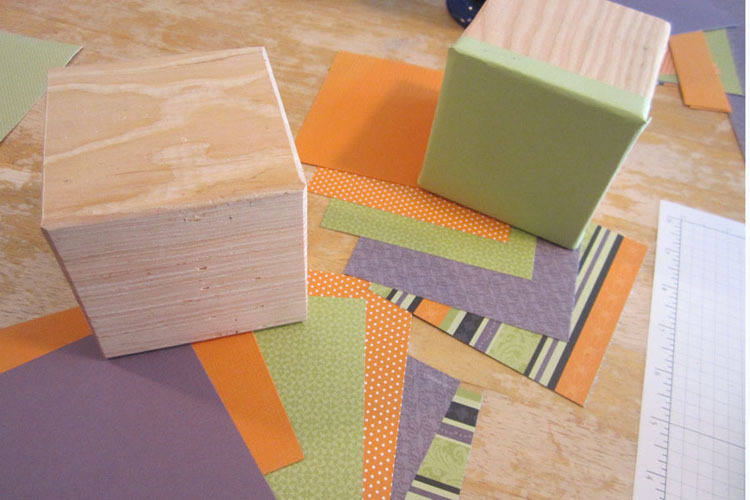 These blocks will require more hard work than just buying pre-made blocks: cutting if you don't have it cut for you, and definitely sanding to soften the cut edges... but the cost is only about $8 for 6 complete sets of these counting blocks ( two 4" squares, and an 8" rectangle - $1.33 a set!!) ... 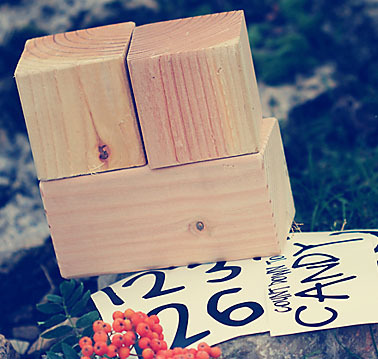 They also have 2x2x8' lumber - which looked to be about half the price if you want a cute petite set of countdown blocks. Quite the steal for the DIY crowd! To finish off the count down blocks, the samples I've seen wrapped up the pieces with a nice thick ribbon and a bow at the top. Unfortunately, my ribbon stash has mysteriously dwindled down to almost nothing (want to get in on my ribbon share?! more details HERE ) and I thought my small ribbons needed a little help! 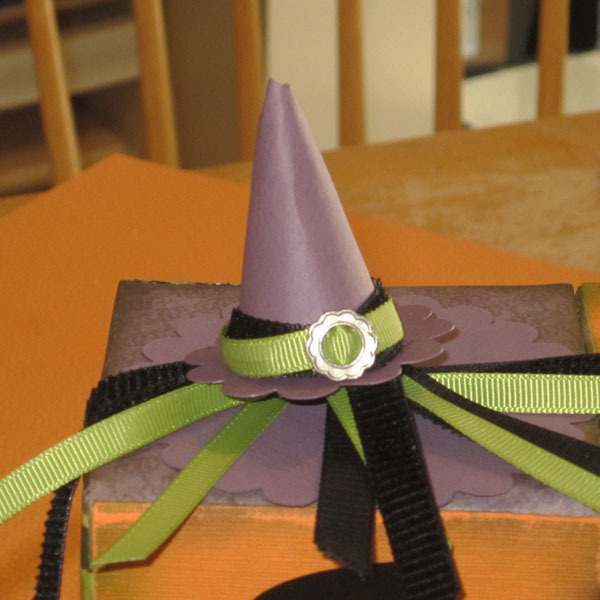 I added a tiny witch hat made from paper, with a buckle accent and coordinating ribbons. what a cute idea... will have to do this one... one for halloween and christmas would be great... thanks for the great share !!! Love this, thanks for sharing the details to DIY it.